The European Union's top diplomat asks the 28-nation bloc to agree "appropriate measures" in response to violence in Egypt. 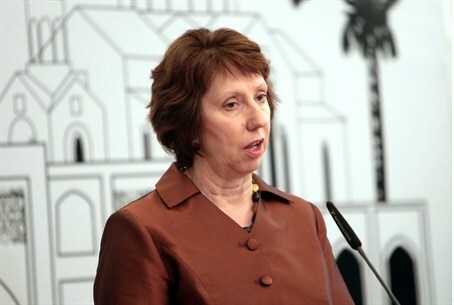 The European Union's top diplomat, Catherine Ashton, on Friday said she had asked the 28-nation bloc to agree "appropriate measures" in response to escalating violence in Egypt, AFP reported. "The toll of death and injury is shocking," Ashton said in a statement. "I have asked member state representatives to debate and coordinate appropriate measures to be taken by the European Union in response to the situation in Egypt." The EU has said top officials from its 28 members will meet Monday to review the crisis in Egypt, notably looking at convening a meeting of EU foreign ministers as soon as possible. Egypt has faced growing international condemnation since around 600 people were killed in clashes on Wednesday as police broke up protest camps of supporters of ousted president Mohammed Morsi. On Friday, scores were killed in Egypt as a Muslim Brotherhood-led "day of rage" turned to bloodshed. At least 80 people were killed and hundreds injured in Cairo's Ramses Square as anti-coup protesters were fired on by government forces. In a statement earlier on Friday, French President Francois Hollande and German Chancellor Angela Merkel raised the idea of the EU rethinking its cooperation with Egyptian authorities. They also called for the EU's foreign ministers to meet as soon as next week "to take stock of cooperation between the European Union and Egypt, and to develop common responses." Ashton said responsibility for the "tragedy" taking place in Egypt in the last days "weighs heavily on the interim government, as well as on the wider political leadership in the country."